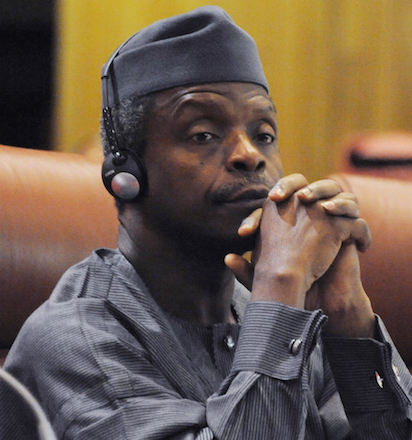 ABUJA-Following his consultations with stakeholders in the oil rich Niger Delta States, the Acting President Yemi Osinbajo has said that a plan to establish a gas industrial park valued at about $20b in the region has begun. Tagged the Gas Revolution Industrial Park, GRIP, Ogidigben, the project which would be realized by Public-Private Partnership was also envisaged to be a regional hub for all gas-based industries. The project would cover 2700 hectares of land with fertilizer, methanol, petrochemicals, & aluminium plants located in the park that has already been designated as a Tax Free Zone by the Federal government. The industrial park would be a cluster for several industries in one location benefiting from an efficient, cost-competitive and abundant supply of natural gas, proximity to a deep sea port and centralized utilities, & services such as uninterrupted power, world class telecommunications and processed water. The park, originally conceived by NNPC, is located about 60km from Warri, and is about 1km away from the operational base of Chevron Nigeria Limited. It will be connected to over 18 trillion Cubic Feet of gas reserves in fields such as Odidi, Okan, and Forcados, located within a 50km radius. It is equally planned that the park will be connected to Nigeria’s most dominant gas pipeline network-ELPS, enabling supply of gas to and from the park. Osinbajo had prior to now at the instance of President Muhammadu Buhari embarked on visits to oil-producing communities to demonstrate the resolve of the administration in the pursuit of a new vision for the Niger Delta. It added that “As a follow-up on the Niger Delta trips, Acting President Osinbajo, alongside the Honourable Minister of State for Petroleum Resources; Dr. Ibe Kachikwu, the Nigeria National Petroleum Corporation Group Managing Director; Dr. Maikanti Baru and other top government and NNPC officials met today with a group of international investors and developers put together under a consortium by Dubai-based firm, AGMC. “The consortium is made up of Fortune 500 companies like the GSE&C of South Korea, the China Development Bank, Power China and several others global operators from Asia and the United Arab Emirates in the Middle-East. Making his remarks earlier in the meeting, the Minister of Petroleum Resources, Kachikwu expressed confidence that the GRIP would bring the much needed succour to the people of the Niger Delta, and the oil-producing states. Also the leader of the group of investors and developers, Sheik Mohammed Bayo stated the commitment of the consortium, adding also that the project was important to solving the Niger Delta crisis.